When you’re on holidays, food is as big a part of your travel highlights as sightseeing and exploring – which is why you don’t want to waste your taste buds on a dud dining experience. Fortunately, if you’re headed to Noosa, around 90 minutes drive north of Brisbane on the Sunshine Coast in Queensland, there are plenty of opportunities to dine out in fantastic style. That’s not to say our top 10 list is full of fancy high-end Hastings Street restaurants: whilst a couple of them did make the cut, we’ve also included some less glamorous but super tasty dining options. From the trusty surf club to the main glitter strip, there’s a place to suit most occasions and budgets when dining out in Noosa. So, whether you’re after a hearty breakfast, tasty snack, a selection of the local region’s best produce or a place to impress visitors, read on for inspiration – as we’ve come up with a smorgasbord of the best! For a low-key first date meeting place, a family meal or even perfect wedding venue, the Noosa Boathouse is the spot. Offering panoramic views of the river and hinterland, it’s also the ideal place for a simple catch up with friends at sunset. You can chatter over share plates of dips, bread, and cheese or salt and pepper calamari and thick cut chips at the Sunset Bar. Or celebrate your birthday in style with a 4 course shared feast! The Boathouse Bistro has plenty to offer for lunch or dinner, plus Little Boaty serves up snacks and treats as well as amazing hot coffee. If you want a picnic without the fuss, grab yourself an order of takeaway fish and chips and find a patch of grass next to the river. The Boathouse really does give you the best of everything! 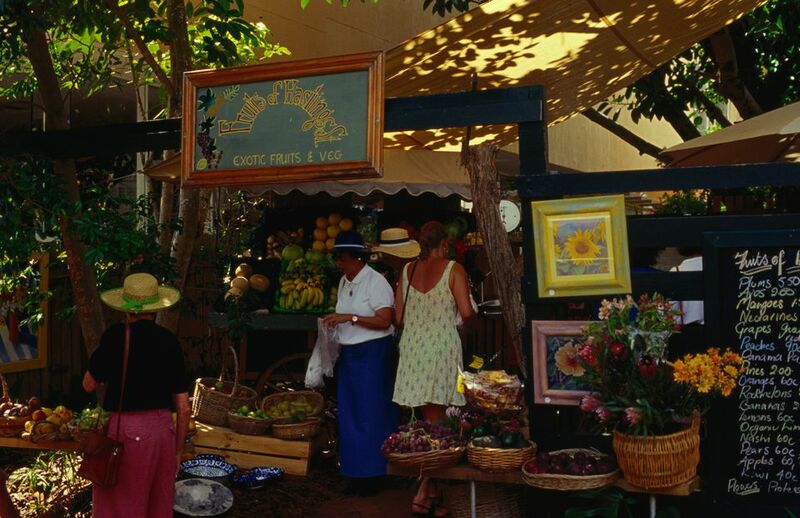 Just a short drive from Noosa is the sleepy town of Eumundi, famous for its markets. Eumundi comes alive every Wednesday and Saturday to offer locals and visitors an array of nick-knacks, artwork, jewelry, plants as well as fresh food and produce. A bunch of stalls return week after week with their delicious aromas fighting for your attention. You can choose from Asian street food, freshly baked breads, and pastries, Greek fare, seafood, German sausages, paella, and pizza as well as grab some fresh juice, fruit and veggies and cheeses for home. If you’re after a relaxed yet superb dining experience, book yourself a table at Little Humid. The top rate service and sensational food make this a go-to restaurant. From the starters to mains and dessert you’re spoilt for choice and will probably end up with meal envy when all the plates are delivered as they simply look divine. Just be sure to save room for dessert: the sticky date pudding is said to be delectable! Perfectly placed at Noosa Wharf Rickys River Bar and Restaurant will certainly impress. Start the late afternoon with a wander along Hastings Street before turning on to Noosa Parade and taking in the river, to find yourself at Quamby Place. Here, seafood lovers will drool over the selection of fish and freshly shucked oysters. If you can’t decide on just one menu option, give the tasting menu a go, with the option of matching wines. There’s a strong focus on regional produce, meaning you’ll get sample delights you can’t taste elsewhere, such as organic lamb backstrap with smoked sweetbreads, scallop ceviche, Coral coast barramundi, or roasted Mooloolaba prawns. If seafood isn’t your thing, their char-grilled eye fillet should whet your appetite. And if you have any space left, you can choose between dessert and a dessert cocktail. Our tip? Save room! You’ve gotta give the Mexicans credit for developing a meal out of chips. If you’re a lover of nachos – and we’re talking THE WORKS; salsa, guacamole, sour cream, cheese – then grab yourself a seat at Chilli Brothers. Granted, it’s not the fanciest place to have dinner. But Sunshine Coast local Hayley Turner says she keeps going back because it’s “top-notch authentic Mexican food made by Mexicans”. And get this – they will even deliver to your desired spot on the beach! Tucked away in Sunshine Beach Village is the ultimate modern Asian dining experience, Embassy XO, serving up an eclectic range of the best Asian cuisines from dumplings to stir-fry, noodles, ribs and fried rice. Choose your time wisely and you can book a table for Yum Cha each Friday-Sunday from 12-2pm, where you can have your fill of smoked ocean trout dumplings, BBQ duck buns and crab spring rolls (with plenty of vegetarian options too). You will come hungry and leave more than satisfied! Go to any beachside hub in Australia and quite often, the best-appointed restaurant is part of the local surf club. It’s generally a crowd favorite too, thanks to an eclectic menu offering fresh seafood as well as big burgers, salads and meaty meals. The Noosa Surf Club is no exception to the rule, boasting all of the above, as well as ‘nippers tucker’ for the kids. They also offer the truly Australian option of surf & turf – adding garlic prawns to any steak (yum). With a beachside breakfast offering on weekends, this is the ideal dining destination no matter the time of day. To mix it up, have a go of the Bruschetta Noosa Style, which adds roast pumpkin, olives, and zucchini to the traditional starter. Something of a Noosa institution, Bistro C is ‘on the beach’ in Noosa’s famous Hastings Street. It prides itself on an ever-changing menu that moves with the seasons, using the best local produce to deliver decadent mains and desserts. “I keep coming back for the delicious cocktails,” says out-of-towner Anna. “But am always pleasantly surprised by the amazing food and atmosphere,” she adds. Check out the ‘What’s On’ section of their website as some days of the week are made just that little more special – and be warned that the restaurant can quickly book out on weekends and during peak periods. If you’re traveling with four or more people in your party, it’s strongly recommended to book ahead. Keen to fill hungry bellies, but you’re not in the mood for all the bells and whistles of Noosa’s famed fine dining precinct? Dukes Burgers may be your answer! For one thing, it will leave adults and kids alike bursting at the seams: the serving sizes leave little to be desired. Their selection offers both fuss-free traditional fare – think of a basic but flavourful burger with tomato, lettuce, onion, sauce, and mayo – through to spicy jalapenos-infused delights and chicken breast burgers. They also cater for vegetarians and little ones, and their onion rings are worth saving room for. If you’re watching your waistline, all burgers can be ordered ‘rabbit style’ – ie. without the bun – and you can pre-order for prompt collection if you’d prefer to take your meal with you. Considering Noosa is a popular destination that thrives under the tourist trade, it would be easy for restaurateurs to do things by halves. It’s clear Bohemian Bungalow doesn’t foster this philosophy, as they clearly want to encourage people to come back again and again! Whilst not technically in Noosa, this Eumundi-based restaurant is worth the short drive from the main beat, as it will delight you on sight with its miss-matched bright furniture, laid-back vibe, and brilliant customer service. Serving up "uncomplicated soul food," it’s hard to decide what to order from the distinctive menu: will it be the blackened barramundi with mango salsa? The lamb gnocchi with crumbled feta? Or the polenta terrine, with smoked capsicum, char-grilled veggies and salty-delicious ​halloumi? Book a table if you’re heading there on the weekend so you don’t miss out on the cool live music. Are Yum Cha and Dim Sum the Same Thing?